There are a lot of screensavers with aquatic theme, but our screensaver is absolutely new product. Here you will move like a submarine at high speed through the water. Download it now for free! 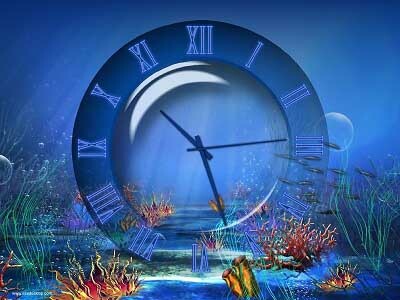 Our new underwater clock screensaver is a wonderful journey into the mysterious world of the oceans. There are a lot of screensavers with aquatic theme, but our screensaver is absolutely new product. Here you will move like a submarine at high speed through the water. On your way you will meet various sea creatures, swims past schools of fish, coral... Aquatic clock screensaver is very exciting! Download it now for free! The flag is the most important symbol of any country. In the Middle Ages, any battle ended only after the flags were captured. Patriots would rather die than allow the enemy to capture the flag. To pay respect to your flag, display it on your screen. A new free screensaver of colour balls flying on a white background from the collection of new free screensavers from http://www.newfreescreensavers.com. Free screensavers. No spyware, no adware, virus-free. It's safe to install and run. If you love flowers, then this screensaver is for you. It is not only beautiful, but also functional. Besides beautiful flowers that will decorate your desktop, you will see analog clock with current time. Screensaver Silver Clock is absolutely free.